I picked a bunch of cucumbers this week and decided to look for a dill pickle recipe, since I still have a bunch of Sweet Freezer Pickles in the freezer. 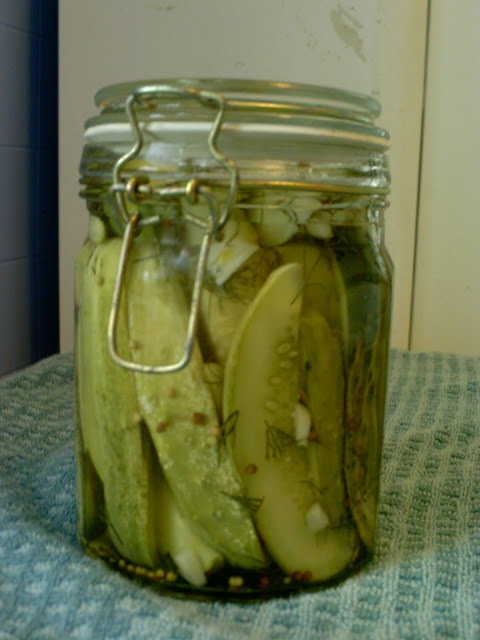 The kids are sweet pickled out, but I think they will go for dill pickles. I came across this recipe from One Perfect Bite (who got it from Bobby Flay) and decided to give it a try. 1) Combine vinegar, sugar, salt, mustard seeds, coriander seeds and dill seeds in a heatproof bowl(not plastic). Add hot water and stir until sugar dissolves and liquid is clear. Cool to room temperature. 2) Place cucumbers, garlic and dill in a large bowl. Toss to combine. Pour brine over all and turn to coat cucumbers. Cover with a plate to hold them down and keep them covered in brine. Cover bowl with plastic wrap or a lid and refrigerate overnight, stirring once or twice. Transfer to an airtight container. Keeps up to two weeks. Here's how mine came out. This is only part of them, the others we ate already were good and crispy! Yum! Our Light Sussex chicks are 7 weeks old today. They are really filling out, and I am impressed by the sturdiness of their legs and feet. To me, they are reminiscent of the Cornish Rock chickens that we raised for meat a couple years ago. I think this is a good thing, since one reason we are raising them is for a potential meat bird. We've had no casualties with the Light Sussex chickens since they were chicks, and the one surviving one that had a crooked neck has recovered and I'm not sure as to which one it even is. It got really hot today (104 plus humidity) and I put some ice cubes in their water. I also gave them some weeds and some bug-chewed chard from the garden to give them something to do. The camera is not working right....I hope to be back soon to post pics or video!